This past weekend I performed at a party hosted by Anita and Igal Kohavi; their talented son Darrin also performed, as well as a few other musicians. I befriended the Kohavi family because I record vocals in their wonderful home recording studio. The party was on the day that marked the one-year anniversary of my father’s death. It was Memorial Day weekend and that was also poignant for me because my deceased son’s birthday falls around that weekend every year. Unfortunately, most of the evening I was worried about whether I saw sparks in my vision, which meant I could be having a retinal detachment. I wasn’t sure if what I was seeing was related to my eyesight or the tiny light bulbs lining the outdoor performing area. I planned to make another appointment with a retinologist as soon as possible or go to the ER if it became worse. I played 3 songs and shared a lot about my life in only twenty minutes. I actually enjoyed speaking more than singing. 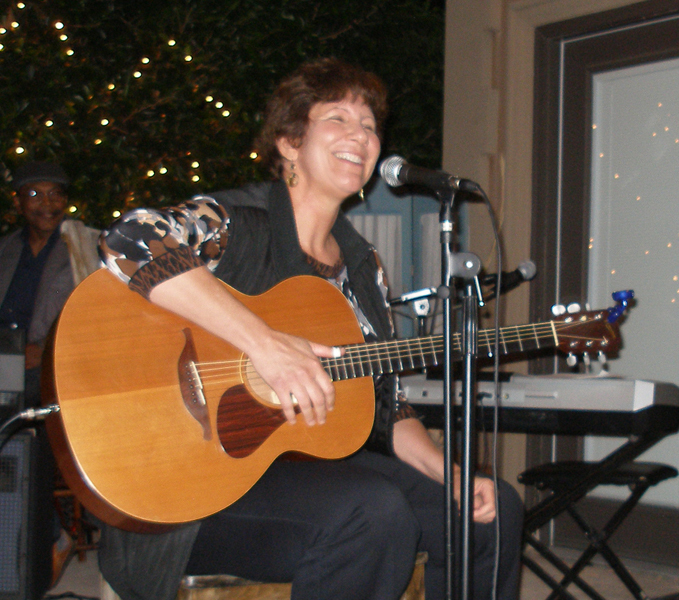 It was very challenging for me to sing because my acoustic guitar blasted through an amplifier loudly; I had little experience singing outdoors. But my audience was receptive; the people listening were kind and embraced me. As I write this post, I am trying gamely to cope with extremely uncomfortable eyesight. My eyes are not mine anymore and this has deeply affected my quality of life. This is a result of both of my eyes experiencing PVD, also known as Posterior Vitreous Detachment. It happened to my left eye in January and last week my right eye was afflicted. It seems that having cataract surgery last year accelerated many problems for me due to my severe nearsightedness. I went on the Internet and the consensus from the medical profession is that this condition is untreatable and something you eventually adjust to; it often takes a year. But I also found words written by other people suffering greatly with all of the same symptoms I had. I see shadows from dark floaters. There is fogginess; many blurs and my eyes actually feel wobbly. On top of this, I’ve developed sensations as a result of a dry eye condition. My eyes continually water and feel uncomfortable. Daylight hurts. I am having difficulty functioning and am discouraged. My brain is screaming loudly that this is intolerable. I quiet the screaming by playing music and it does help. But my days are harder than I ever imagined. There is a part two for this post, where I will write more about this. I wonder when I will start feeling better. 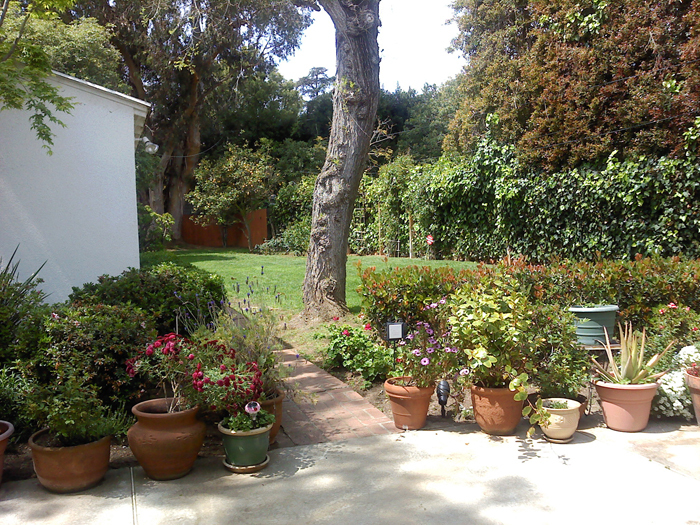 I took this picture in Kimberly’s back yard while waiting for my voice lesson. Although it was a beautiful day, the floaters and blurs in both eyes disturbed me greatly. I have no regrets about where my life is right now. I love the freedom I have to pursue my music and singing. I go to places that heal me and feel as if I am the richest woman in the world. There are so many things I am grateful for. Often, when I am faced with suffocating stress I use humor to help me. I started to write, “There is no end to stress for me,” but decided it would lead to more stress and that certainly wouldn’t be helpful. I really do try to frame all of my thoughts in a positive way. For two weeks, I’ve had a refrigerator that defrosts and refreezes. Once again, I thanked my father in heaven for buying me an extended warranty. The first repairman that came told me he couldn’t find a problem. On that day, the refrigerator was “refreezing” and getting cold again. Two days later, my floor was covered with towels to soak up the puddles again. I was back on the phone with the warranty department for the umpteenth time. The good news after all of this stress, was that I would be getting a brand new refrigerator. My refrigerator was determined to have a Freon leak, which could not be repaired. I felt a big splinter in my own mouth at that moment. What I thought was a chip of ice, turned out to be a chunk of a Popsicle stick. 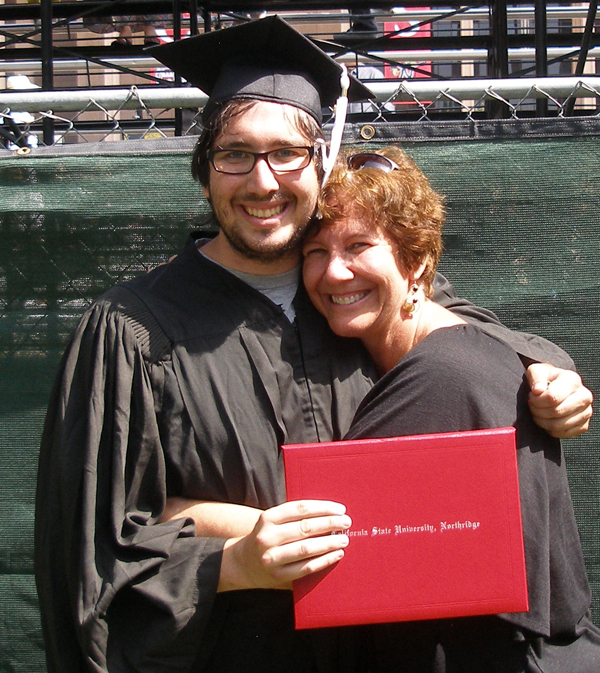 Last week, my oldest son graduated for college. I was waiting with a camera and felt lucky to have planted myself in a perfect spot; I was in front of the processional that was soon to begin. I planned to capture the perfect moment as my son marched forward. My eyes were teary and my heart swelled as the graduation march played. I watched face after face walk by – eyes sparkling, hands waving and feet dancing. I couldn’t wait to see my son. Fortunately, he did make it. I received another text message that he was able to hop a fence and sit in the area with the other graduates. After the ceremony we connected and I finally got some beautiful pictures. He told me it would be okay to share our picture. From the beginning of my journey, I have written with complete honesty. The title of this post is a line of lyrics from my song “The Unknown.” I have not shared that song yet because it is very personal and painful for me. The line of lyrics “With all this pain, I can’t remain,” relates to three things in my life. 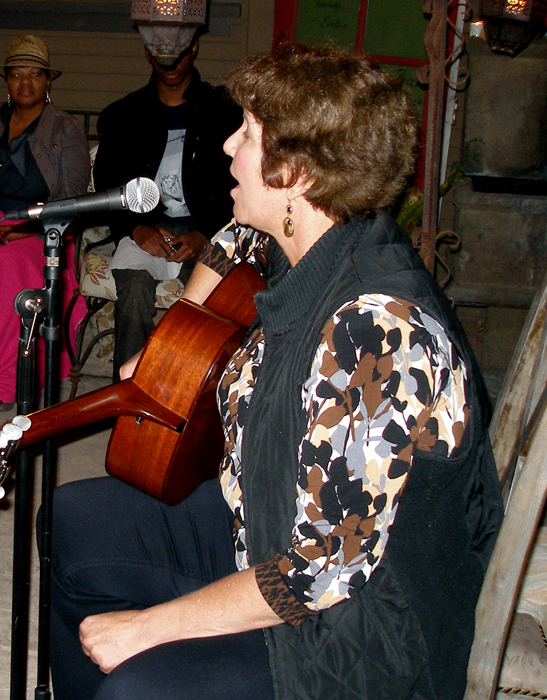 In my song, it is about the pain in my marriage. And those words apply to my eyesight, as I struggle with complications related to my three cataract surgeries. Lastly, those words also relate to my feelings about grief. I began my blog by spilling out everything I was carrying inside for decades. I was truly living like a zombie because I never expressed any of my feelings. The release and joy that I found as a result of writing for my blog, ground to a halt when I realized that I could not share with honesty what I was living with on a daily basis. I wrote my song “The Unknown” during a very lonely time in my life. My marriage was empty and had been for a very long time. My parents could no longer emotionally sustain me and their decline was devastating. For certain, my husband was miserable, too. I was terrified to address my situation. I didn’t want to hurt my husband or children, but it was impossible for me to continue sleeping at the edge of the bed, never being touched or complimented. My husband was not a bad person and I didn’t want to hurt him. It would have been unfair to force him to change into someone he could never be. I was married to a man who was extremely negative about life and I couldn’t counter it anymore. My heart had grown cold and felt like stone; there was no chance I could have feelings for him ever again. The thought that my life was this dreary at the age of 53 was too sad to face. I decided I was ready to face turning both our lives upside down because this was not really living. Our communication was so poor, that we never even discussed why I wanted a divorce. I was racked with guilt for hurting him because he was a good person. At this moment, I believe I am suffering from post traumatic stress disorder. Simply shopping in a supermarket floods me with painful memories. A carton of strawberries can evoke heartache because I remember constantly buying them for my husband. I always made sure he had a bowl prepared every morning and evening. Despite the emptiness I felt and our extreme lack of communication, I always tried to make his life easier and do the things that I hoped would make him happy. It was an unending job that filled me with frustration. Recently, a friend was joking. He imitated my husband by admonishing me loudly for putting something down in the wrong place. But while he was laughing, I started shaking and then began to cry. He was sorry and I was ashamed at my reaction. But it was understandable for me. In my former life, I was so used to making sure that everything was in its place; my life was filled with many rules to follow. Doors and windows had to be closed or open in a certain way. The toilet seat always needed to be up in our bathroom and the shower door left half open. I never succeeded at completing all of those tasks; there was such a long list of rules in my brain. My husband constantly reminded me of my failure if one thing was not done properly. I could not keep up with getting my children or housekeeper to follow the rules either. I relish my new life where I still follow many of those rules because of decades of habit, but am relieved that no one is looking over my shoulder. 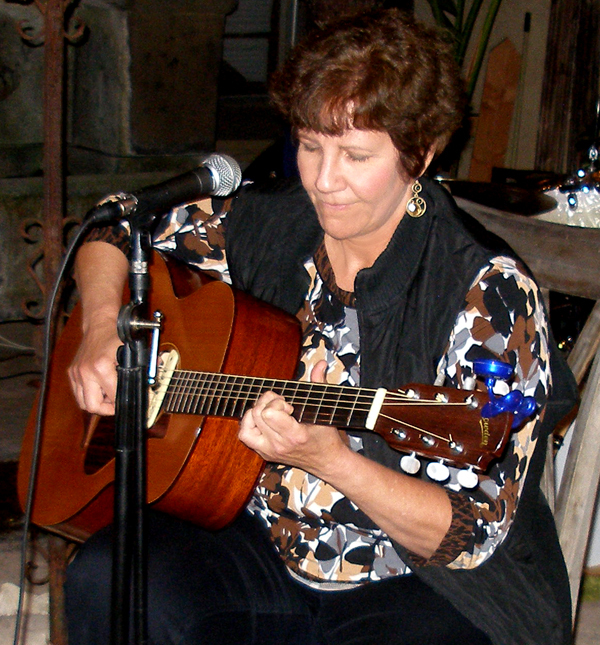 This entry was posted in Uncategorized and tagged acoustic guitar, cataract surgery complications, cataracts, Cataracts when in fifties, composing, coping with divorce, divorce after a long marriage, eye gel separation, eyesight adjustment, gray divorce, guitar, impending divorce, inspiration, loss, lovesong, Music, original songs, performing, Posterior Vitreous Detachment, separation, separation and divorce, singing, songwriting, writing. Bookmark the permalink. I am so sorry to hear all that you are going through. You are in my thoughts and prayers. Judy, my heart aches for you. You are in my prayers every day. The next time we are able to make it down to So. Calif we’d love to visit you. Your music is beautiful. Makes me cry. I think of you often. When I see Graham’s sweet face it makes me cry, too.